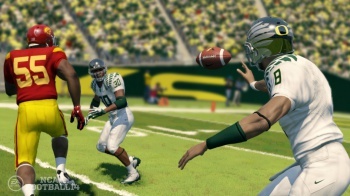 Mere days after the release of EA's NCAA Football 14, the NCAA has announced that it will not renew its college football licensing contract with the games publisher. NCAA Football 14 will be the last EA title to bear the official NCAA license, at least for the foreseeable future. That news comes courtesy of the NCAA itself, which explains the decision by saying that "given the current business climate and costs of litigation, we determined participating in this game is not in the best interests of the NCAA." Costs of litigation? Oh right, the NCAA must be referring to the ongoing lawsuit brought against it by former UCLA athlete Ed O'Bannon which seeks not insignificant sums of money in return for the use of his image and those of other collegiate athletes. O'Bannon holds that the NCAA has been making huge profits by licensing away the likenesses of amateur athletes, and given that these athletes are a huge reason why people buy college sports videogames in the first place, O'Bannon wants his cut. But what does this mean for EA? That depends. This could go in a number of different directions. While EA has yet to offer an official reaction to this news, it does not necessarily spell the end for the NCAA Football game franchise. The NCAA license merely gave EA the right to use official NCAA intellectual property (such as BCS Bowl names), whereas individual schools hold their own licensing rights. Thus, EA could continue the series without the NCAA license per se, though it would definitely be a vast departure from the newly-released NCAA 14. On the other hand, since the NCAA Football franchise has been such a long-running, lucrative property for EA, the company might find some way to work out a new agreement with the NCAA that would allow the series to continue in its current form. There's any number of variables in play here, so this possibility is entirely up in the air. The least likely scenario would be that EA ditches college football entirely. That NCAA license is very important, but EA makes far, far too much money on its college football titles to simply scrap the entire line. EA is a huge corporation after all, and it exists purely to generate as much money as possible. If there's any conceivable way to work out a deal with the NCAA, we have to assume that EA's legal team will figure it out. By now, most fans will have heard that EA's licensing agreement with the NCAA is set to expire and that we have agreed to part ways. I'm sure gamers are wondering what this means. This is simple: EA SPORTS will continue to develop and publish college football games, but we will no longer include the NCAA names and marks. Our relationship with the Collegiate Licensing Company is strong and we are already working on a new game for next generation consoles which will launch next year and feature the college teams, leagues and all the innovation fans expect from EA SPORTS. We took big creative strides with this year's college game and you'll see much more in the future. We love college football and look forward to making more games for our fans.